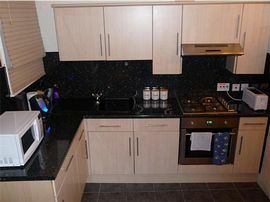 To ensure a relaxing vacation the apartment has been prepared and maintained to an excellent standard. These efforts have been awarded, year on year, with 4 stars by The Scottish Tourist Board. 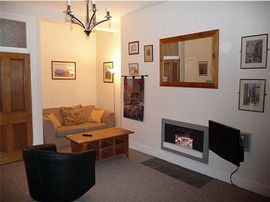 It is a comfortable and spacious 1 bedroom apartment with unique views up and down the Royal Mile. The lounge has a wall mounted LCD T.V. with multi station free view and radio, DVD and CD player. 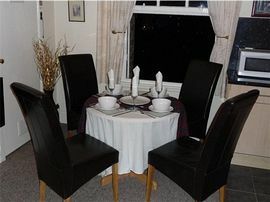 It has a comfortable double sofa bed for 2 additional guests and is open plan to the kitchen and dining areas. The kitchen is well stocked with all the quality utensils for those amongst us who love to cook and for those who like to travel light, there are full laundry facilities for your use. The dining area over looks the roof tops of the New Town and to the right the monuments of Calton Hill. 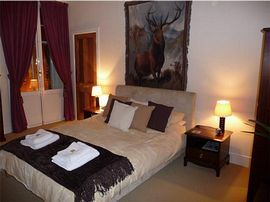 The comfortable bedroom over looks the Royal Mile and its prime window has a full height secondary double door with special acoustic glass to ensure a peacefull nights sleep in its luxurious King size bed. 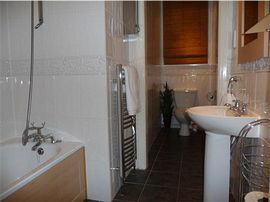 The bathroom is fully tiled and has a modern 3 piece suite inc bath with over shower. It also has a heated towel rail and shaver socket. The apartment has full central heating and for that extra cosy feeling during the winter season, a designer, white stone effect, open, landscape gas fire. Please note: The apartment is on the 3rd floor and like many city centre apartments has no lift (elevator) it is therefore unsuitable for some disabilities. Superb unique views on to the historic Royal Mile. Central to all Edinburgh's city centre attractions. Linen for Kingsize bed and double sofa bed plus blanket bale for cot if required. Towels provided. Local Services: The apartment is extremely central to all the city centre attractions, however if you wish to go further afield eg the Zoo or beach there is a great bus service just around the corner in Princes Street. Dining out is a breeze with a multitude of eateries of every cuisine and tarriff within short walking distance of the apartment. Follow A1 westbound to the beginning on Princes Street. Turn left onto A7 North Bridge. Take first left onto High Street, Royal Mile. Entrance is short distance down on the left, next to Rabbie Burn's Cafe. Come out of Waverley Station onto Princes Street. Turn right along Princes St and turn right onto North Bridge, Turn left onto the Royal Mile and entrance is a short distance down, on the left. Take the shuttle bus from Edinburgh Airport to East End of Princes Street. Walk up North Bridge, turn left onto the Royal Mile. Entrance is on left, a short distance down. Due to insurance and apartment preparations reasons we are unable to change these times. "Loved every minute. Great apartment, great City. Will defenately be back next year'." J.C. Northern Ireland. "Couldn't believe how close we were to everything. We will be recommending to all our friends." W.E. New York . "If I realised how central your apartment was I wouldn't have brought the car." R.S. London. "A real home from home. Thank you Colin." S.T. Canada. "We had a great Christmas. Thanks a million for putting up the decorations. The kids loved finding the little Robins you hid around the apartment." R.T. Eire.